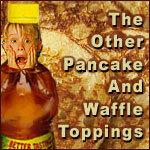 Collectively, we pancake and waffle lovers are in a rut. Granted - if you have to be in a rut - the habitual use of maple syrup as a topping isn't too bad of a rut to be in. The 18th century suicidal English poet William Cowper once wrote, "Variety's the very spice of life, that gives it all its flavor." Perhaps, if he had applied his theory to pancakes and waffles, he wouldn't have been depressed all the time. Talk about a rut. That guy takes the (pan) cake. Next time you run out of maple syrup, don't fret. There's a whole world of new toppings to try. The Shakespearian poet Nicholas Rowe may have said it more eloquently, "When our old Pleasures (maple syrup) die (runs out), Some new One (topping) still is nigh; Oh! fair Variety (pancakes and waffles)!" So now, as Prince Rogers Nelson (you may know him simply as Prince) said in 1984: "Let's go crazy! Let's get nuts!" What do you like on your pancakes and waffles? Here's some ideas sent in by some great breakfast lovers. Help us keep the list growing. Send us your ideas.